From Roman pay-offs to Pictish treasure, silver has long been the currency of Scotland. Ahead of the major National Museum of Scotland exhibition, this extract examines why silver – rather than gold – has provided the most valuable clues in furthering our understanding of social change from Roman through to Victorian times. Silver was the most precious metal in Scotland for a thousand years. This book tells the story of this powerful material during a pivotal time, from the arrival of the Roman army until the dawn of the Viking Age, 700 years later. We trace silver through changing times, as Roman Iron Age tribal societies gave way to a patchwork of Early Medieval kingdoms. Silver provides a valuable path through this period of transition and social change, a time when historical sources give us few clues and where a firm archaeological footing is rare. Silver first arrived in Scotland with the Roman army in the 1st century AD. Handfuls of silver coins – a soldier’s pay packet – and precious dress accessories were the earliest silver objects used in Scotland. From these small beginnings grew a new social order, built on the haves and have-nots, those with and without silver of their own. One hundred years of Roman frontier policy brought substantial quantities of silver coins to the north, gifted to buy off Iron Age tribes beyond their borders. These coins had no monetary value beyond the Roman frontier – instead they had prestige, being used to show off and given as offerings to the gods. Hoarded and buried, this silver was not melted down. But crises in the Roman economy in the 3rd century AD meant that ‘silver’ coinage contained increasingly little silver, making it an unattractive gift. Instead, hacked-up high-quality silver objects, especially vessels, were turned into bullion; and for the first time in Scotland they began to be recycled into new, local types of objects. This was the start of generations of recycling – the forging of new status symbols. From elaborate Roman vessels a new Early Medieval language of power was wrought, spelled out in massive silver chains and intricately decorated brooches. Worn and buried, hoarded and melted, these objects speak of the transformation of society through the first millennium AD. Why silver? The answer is a combination of availability and choice. Though the Roman economy relied on gold, Roman foreign policy in Scotland worked almost entirely in silver. This is a sharp contrast with other parts of Europe beyond the Roman frontiers where gold and silver were used to buy ‘barbarian’ allegiance. These different inheritances of Roman metals had implications for what happened next. 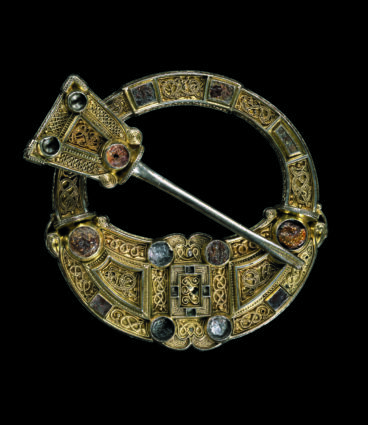 While in England and on the continent gold became the epitome of Early Medieval wealth and social status, in Scotland silver loomed large. Availability always governed its use, but silver was chosen for local expressions of power. Silver can be valued in different ways. The tipping point between these kinds of value tells of societal and cultural attitudes. When silver was first introduced to Scotland the scales were firmly tipped in favour of social value: this Roman silver was not treated as bullion, not melted down or made into local types of objects. Around the 3rd century AD, the scales tipped the other way, towards bullion value: Roman silver began to be recycled and remade into new types of objects. From then, those using silver had to make a choice – to preserve a silver object, to recycle it, or to take it out of circulation by burying it. Understanding how, when and why these choices were made can tell us a lot about the political and economic history of Iron Age and Early Medieval Scotland. But these ancient choices also have significant implications for interpreting archaeological silver. In the face of failing supplies in a post-Roman world, substantial ancient recycling has left us with relatively few silver survivals. Very rare hoards give us glimpses of objects that chance saved from the crucible; many are exceptional, even unique. But this rarity makes understanding objects difficult, restricting our ability to date or provenance key pieces. And the tensions between social and bullion value are not just an issue for deep history. The tipping point between archaeological value and bullion value in the 19th century saw quantities of ancient silver recycled into Georgian and Victorian tableware. Written accounts of the time are the only trace of tantalising treasures lost to the crucible. 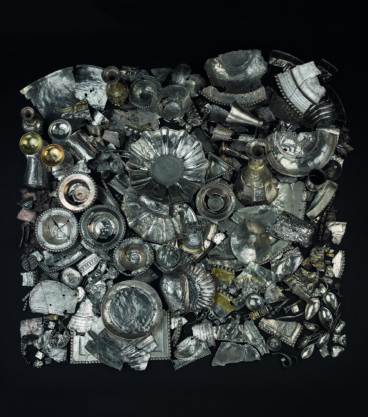 This book accompanies a special exhibition, Scotland’s Early Silver, at the National Museum of Scotland (October 2017–February 2018). It tells a new story of an old metal – one which used to be more powerful than gold. 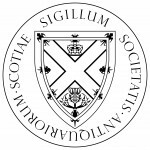 This excerpt is from the introduction to Scotland’s Early Silver by Alice Blackwell, Martin Goldberg and Fraser Hunter, to be published 13 October by NMS Enterprises Ltd – Publishing, National Museums Scotland.